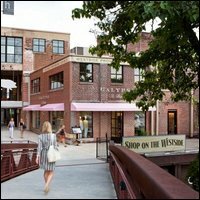 Westside Provisions District is the centerpiece of an eclectic and bustling community in Atlanta’s West Midtown neighborhood. It features retail, restaurant and residential space and occasionally hosts special events. Once home to Atlanta's first modern meatpacking district, West Midtown fell on hard times by the late '90s. The arrival of Westside Urban Market turned the fortunes of the area around, and put into motion the events that led ultimately to the creation of Westside Provisions District.